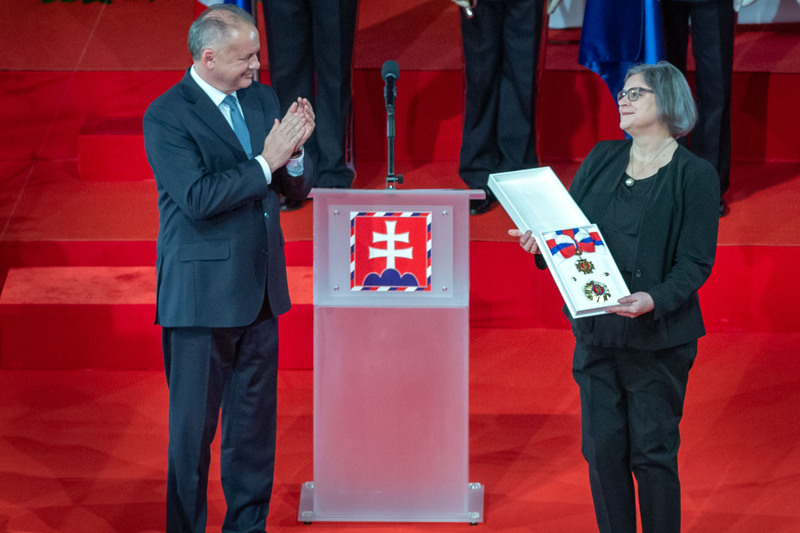 ASPEKT is overjoyed to announce that on 8 January our co-founder Jana Juráňová received the Order of Ľudovít Štúr (First Class) from Slovak President Andrej Kiska for her extraordinary contribution to the development of democracy, human rights and freedoms, as well as her literary activities. We are proud and delighted! “I am not a single-theme author,” she says. Nevertheless, once Jana Juráňová (who was born in Senica and has spent most of her life in Bratislava) gets her teeth into a subject, whether she covers it in her theatre plays, short stories, novels, children’s books, or her fearless journalism, she always leaves a deep mark. She has an extraordinary ability to capture human loneliness, discontent, and the struggle to overcome personal difficulties. She has engaged in an unusually wide range of activities, having worked as a dramaturg and literary editor, as well as commentator for Radio Free Europe, and never ceasing to stand up for human rights. Twenty-five years ago, jointly with Jana Cviková, she founded ASPEKT, a unique feminist educational and publishing project. Jana Juráňová breaks gender stereotypes, applying a healthy dose of irony to deconstructing well-known figures of Slovak history and speaking out on the most burning issues of the day.